The memes and mockery abound, but "Sharknado," which has conquered audiences, netted dozens of celebrity cameos such as George R.R. Martin, Ne-Yo and Kelly Osbourne, and has turned into an annual event. The fifth installment of the TV movie series about airborne sharks arrives Sunday with new celebrities and international settings. "As a viewer I appreciate it because it's fun, it's escapism, it's pure entertainment. But how do you explain it? I don't know," said series star Ian Ziering, who along with Tara Reid fights a tornado of sharks with a chain saw. "Major motion picture studios spend hundreds of millions of dollars trying to capture some of whatever it is that makes our little 'Sharknado' movie globally popular." "It's kind of like the secret sauce: No one really knows for sure. I wish I knew, I would be making my own movie," he said with a laugh. 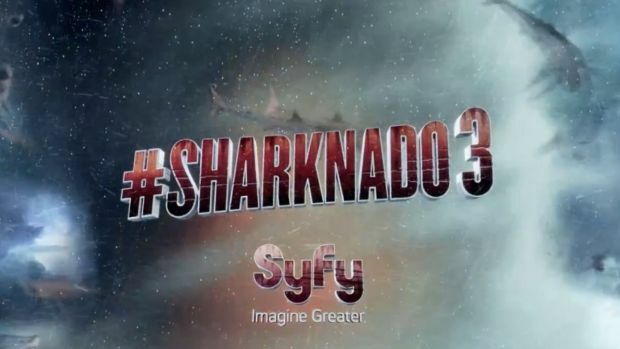 "Sharknado: Global Swarming" premieres Sunday on Syfy. (Syfy and this station are both owned by NBCUniversal.) It finds Ziering's Fin Shepard an expert in "sharknados" who is called upon by governments around the world to fight the crazy phenomenon. Ian Ziering, star of SyFy's record-breaking "Sharknado" franchise, chats with us about what's in store for Fin Shepard this time around. He also hints at Tara Reid's fate. "Sharknado: The 4th Awakens" premieres Sunday, July 31, 2016. Filming took the cast and crew to Europe, Asia and Australia. This year's cameos include Olivia Newton-John, Bret Michaels, Clay Aiken, Charo and Mexican weather girl Yanet Garcia. "Now that we've become a global movie it's not just people who want to be in the movie, there's countries who have solicited," Ziering said. "I think the craziest place that we shot that was, (where) they were looking at us like we were out of our mind would be Tokyo when we were running in the streets at night, like screaming. They don't understand the language, and they're looking at us and this crazy hair, and he's got this in his hand, People were like, 'What the hell is going on?'" Reid said. The plot has been nonsensical from the beginning and has created many memes on the web. Even Ziering found it ridiculous at the beginning. "When I read the first 'Sharknado' movie I thought It was terrible, I told my wife that I couldn't do this movie, that it would be the end of my career," said the actor, who starred in the popular '90s TV series "Beverly Hills 90210" and "Melrose Place." "I am an actor, but my most important job is provider of my family. I didn't have very much confidence in the movie, but I did it anyway to provide for my family." Flying sharks return tonight on Syfy in "Sharknado 3: Oh Hell No!". NBC's Raphael Seth has a sneak peek. The love of the fans has led to a yearly installment since 2013, all of them directed by Anthony C. Ferrante. For Ziering, the biggest challenge has been "keeping it all together." "We're saying things that are so ridiculous that sometimes you really want to laugh really hard," he said. "But you have to take all of this really seriously, because in the context of this movie these are very serious scenarios." At this point the only way he would stop being part of "Sharknado" would be "if Fin Shepard ever got eaten and is not able to chain saw his way out of the shark." --Associated Press Writer John Carucci contributed to this report from New York. CORRECTION (Aug. 4, 2017, 2 p.m.): An earlier version of this story misstated the fifth "Sharknado" film's title.